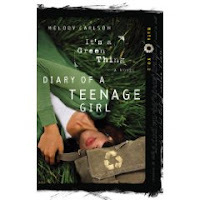 Melody Carlson is an award-winning, best-selling author of nearly 200 books for teens, women, and children. Before publishing, Melody traveled around the world, volunteered in teen ministry, taught preschool, raised two sons, and worked briefly in interior design and later in international adoption. "I think real-life experiences inspire the best friction," she says. Her wide variety of books seems to prove this theory. She and her husband enjoy an active lifestyle of hiking, camping, and biking in the beautiful Pacific Northwest, where she says, "A new story seems to spring from around every corner." My cousin Kim gave me a new diary yesterday. She received it for graduation, but she prefers to journal on her computer. “With a security lock, of course,” she confessed. Anyway, this nicely bound book (a green product made of recycled materials) seems to be enticing me to write. Especially since I already filled up my old diary, which is safely hidden away in one of my suitcases tucked into the back of the guest room closet. Okay, as both Kim and my uncle keep telling me, “It’s not the guest room, Maya. It’s your room.” I’m trying to see it that way. But it’s not easy. So much about my life is not easy…but I must admit that it’s getting better. And I do have hope. Anyway, since today was rather interesting and the beginning of summer vacation, I will start here. Although to get “here,” I need to go back to before the school year ended. I’d been attending Harrison High for several weeks when Mr. Fenton challenged our art class to volunteer for a community project. We’d been invited by the park district to create a mural on a downtown youth center. A lot of kids signed up, and everyone seemed supportive and interested. But today, the first day of the project, Marissa Phillips and I were the only ones to actually show. “It figures,” she said as the two of us stood gazing up at the big, boring wall. The paint was splotchy looking, with random beige smears that resembled a bad case of psoriasis. Probably someone’s attempt to hide the graffiti and tagging, although a few offensive words still showed through. “What do you mean?” I asked. “That no one else would come.” “Why’s that?” I adjusted the twisted strap of my Osh Kosh overalls. I’d gotten dressed pretty quickly this morning, barely managing to catch the downtown bus. “Because people are basically selfish.” I turned and looked at her. With hands planted on her hips, Marissa stared at the ugly wall and frowned. For some reason, when I first began attending Harrison High, I felt drawn to this girl. Like we shared some commonality. And I suppose we do have some physical similarities. We’re both tall and have long hair, although hers is straight and mine is curly. And because she dyes it black, her hair’s a lot darker than mine. I think that’s why her complexion looks so pale. Whereas mine (thanks to my dad) is the color of café au lait. But our looks aside, we are similar in other ways too. Or maybe we both just have an attitude. She’s not afraid to speak her mind and has opinions that not everyone shares. She’s two years older than I am. In fact, she just graduated with my cousin Kim. Not that she seems older exactly. Or maybe I just feel older than sixteen. Sometimes I feel like I’m in my thirties. But a hard life can do that to a person. “Driving under the influence?” I knew Marissa was kind of a wild child, but I thought she had more sense than that. “Your dad’s a cop?” Now this caught me off guard. Of all people who might have law enforcement officials in their family, Marissa just doesn’t seem to fit the profile. I can only imagine how frustrated her father must feel. “Yep.” She blew another puff of smoke over her shoulder. “You mean because I must be basically selfish too?” She shrugged. “I wouldn’t mind so much, except that it’s going to be scorching out here before long, and this wall is in the sun most of the day.” She reached in her bag again, and this time pulled out her cell phone. where we’re going with this mural and get the paint and stuff. Maybe not today. But how about tomorrow? First thing in the morning?” She got a catty smile now. “Oh yeah, totally.” Then she hung up. “Sounds like it.” She slipped her phone back into her bag. “We’re talking about Spencer, right?” She laughed. “Of course he has the wrong impression. It’s just the way that boy’s brain is wired.” And I was fully aware of this. Spencer had begun hitting on me as soon as I started going to HHS a couple of months ago. I’d been flattered at first, but as I got to know him better, I realized that I needed to draw some boundaries. Even so, I wasn’t going to admit that Spencer wouldn’t have been my first choice for help. “So…do you think I should call anyone else?” I offered. “Sure. Do you know anyone else?” I kind of shrugged. I took in a deep breath, then slowly nodded. “Actually, I am.” She shook her head in a dismal way. Like this was really unfortunate. “I’ll admit it’s still kind of new for me,” I said. “Why?” Her dark eyes narrowed as she studied me closely. I started to feel like a bug beneath a magnifying glass. “No. Why did you do it?” The way she said this made a woman walking through the parking lot glance nervously at me, like she assumed I’d committed some horrendous crime. “And now you’re found?” I could hear the teasing note in her voice. “Actually, I do feel kind of found.” She rolled her eyes. crazy. Seriously, I never would’ve believed it myself.” Her countenance softened ever so slightly, and she didn’t question this statement. I smiled. “I’ll take that as a compliment.” The fact is, of all the Christians I know, which aren’t that many, I can relate to Chloe best. I mean, Kim is cool and takes her faith seriously. And Caitlin is sweet and sincere and helpful. And Nat… Well, don’t get me going there. But right from the start, I seemed to get Chloe. And she seemed to get me. Maybe it has to do with the whole music thing—a kind of artistic, outside-the-box sort of thing. “So what do you think we should paint on this wall?” Marissa seemed eager to change the subject, and I felt relieved. “Yes sir.” She gave me a cheesy grin. “You the boss.” Before long we were sitting there on the curb, discussing ideas and playing with images. Unfortunately, Marissa’s ideas leaned toward the dark side, and when I challenged a particularly frightening image, she seemed slightly offended. of money, and you’ll be just fine. Just before I made a smart retort, I stopped myself. “Hey, maybe you’re right.” I grabbed my sketch pad and began to draw. “But we’ll design it in a more modern style. Sort of cubist.” She looked over my shoulder as I drew a series of sharply angled shapes, working them together to make an arch. Marissa laughed. “Yeah, I’m pretty good at meeting people’s low expectations.” I wanted to ask her why that was, but we needed to get busy if we were going to put more volunteers to work tomorrow. And to my relief, Marissa actually knew how to work hard. By the end of the day, Marissa had gotten the paints, and I had managed to get a fair amount of the sketch onto the lower part of the wall. “Nice work, boss,” Marissa said after we’d put the supplies away and stood looking at the beginning of our mural. “Same back at you.” And I have to admit that I was kind of excited to see how this whole thing would turn out. And hopefully more people will show up to help tomorrow. Don’t pour harmful wastes down public waterways. and can harm innocent fish or other marine wildlife. So don’t use your street drain as a dumping spot. I just received this book a couple days ago along with Experiencing the Spirit by the Blackaby's. So as soon as I have a chance, I will read it and review it.